As my ride time increases, so does resting with my legs elevated on the couch watching late-night TV. Occasionally, a movie and a home theater experience with the family too. Us cyclists may obsess about the bike, but I’ve not met any that are one dimensional; especially on a long ride when the usual bike topics are exchausted. So today I’m introducing more tech topics here, starting with a review of Soundbars. These posts are from the “what we’re into and using these days” category. Wrote earlier on G+ about Soundbars and my initial experiences with Yamaha’s YAS-101. Liked that soundbar so much that I just upgraded to the YSP-2200. That means when a black cat runs down an alleyway, you hear it patter by; a sword fight is in front and cannon fire from pirate ships to left and right. Yeah, so? Well, this surround sound is achieved with a mere 132 watts in a 38 inch wide, piano-black, thin wedge, and a computer-box sized subwoofer. I was skeptical too. When I first built our home theater, I tried a Bose 3.1 system to not have wires running across the room and speakers strewn about. It sucked and like many, lower-end systems was really just loud without any spatial separation or soundstage. You’ve got to hear the Yamaha to believe it yourself. After the initial, auto-setup, I customized the beams to my room moving them off-center to the right and into the sweet spot in front of the couch. You’ll find overwhelmingly positive Amazon reviews about the YSP-2200, awards from magazines, and an audiophile whose world was changed by it. In my room, the Yamaha’s ability to produce big, broad, involving sound from a single, compact physical source was astonishing. One of the first things I played on the YSP-2200 was a baseball game, presented in fairly effective Dolby Digital, and the Yamaha’s conjuring of a true bubble of ambience encompassing the listening position was hugely impressive. My perception was changed too, because like many, I just didn’t want to deal with the complexities of another 5.1 system. I took the original system apart when we remodeled a couple years ago and with a hurried move back in, I hadn’t got to rebuilding it. I decided to re-theater the room when we got back from holiday this year. Thinking about it more, I also decided I didn’t want speakers and wires all over the room anymore. Looking at the big box of wires, I was worried if a tweaker knew how much copper I had in storage, they’d creep Hugga HQ. If they show up, they can expect a swift cleat kick to the nuts! Yamaha’s DSP tech works. If you’re not hearing a soundstage, it’s most likely the room isn’t right for the system or you need to spend more time in the manual setup. In the AVS Forums, there’s much talk about DSPs and one guy (davyo) that’s obessed with them. An audio engineer (drfreeman) offers much good advice about listener fatigue, getting used to the sound, and NOT whomping the bass. Any system can do loud, what I wanted and got was enveloping clear sound. I set the volume when watching movies at just enough to hear the 5.1 and with the bass just noticeable. I also increased the center channel for voices after moving the stage center right. As drfreemen wrote, you do need to get used to how a DSP sounds. In the manual setup move, the DSP plays white noise that you can move around yourself. Another test is if your dog leaves the room when watching a movie, it’s too loud. I don’t get into horse races with any tech. I didn’t spend much time reviewing every other system or trying to get the worlds best –davyo did that already. As I wrote earlier, for me it was, “suddenly a soundbar” and then I upgraded to a better one. On Yamaha, I like to see a company maintain its strong brand and happy to pay extra for the build quality. Out of the box, Yamaha DSPs do not feel like cheap, plastic toys. That matters to me. It’s like my decade-old Pioneer Elite A/V reciever that powered my original 5.1 theater. I bought the DSP from Amazon.com for $800.00. Speaking of the Pioneer and to complete this story, now that I’ve got a DSP-based home theater, I drug the old Boston Acoustics speakers from the original 5.1 system out of storage. I set up the center, left and right channels on the fireplace mantle like a bookshelf stereo and connected them to the Pioneer with the subwoofer stashed in a corner. New receivers from Pioneer ship with AirPlay built in. Also see the new Twenty from Griffin. 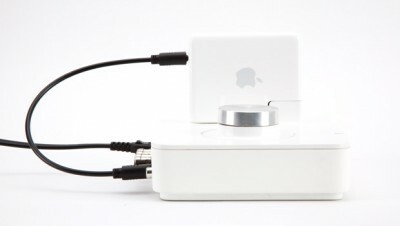 That powers a set of speakers, subwoofer, and acts as an AirPort Express dock. Streaming Pandora with AirTunes is like the clone stamp in Photoshop or Aperture 3. Amazing. Last night at a Hugga HQ party, I had a party playlist set up on the iPad and when we got through that, closed out the night with the Brubeck Brothers channel on Pandora. I’m not so much into DJ’ing anymore, but I’m sure DJs are running entire sets and shows from the iOS devices. If they’re not, expect they will. Now that I’ve got the theater setup with a DSP and streaming music, maybe the next thing is ambient LED lights timed to the music, like a laser light show? I will get a record player and connect that to the Pioneer and play some old records I’ve also got in storage. I know my teens have never seen a platter spin. I may even scratch one for them like I used to do, when I DJ’d.